Captain Dean Keates has agreed a new one-year deal with Wrexham but admits he was uncertain over his future after Kevin Wilkin's arrival. Keates, 35, made 29 appearances last season but missed the opening two months of the campaign after having a toe operation. Manager Wilkin pledged changes following a disappointing season. "We had a new manager come in with only a few games left and he's assessing everybody from the off," Keates said. "What you've done throughout the course of the season before kind of puts it in jeopardy." Former Walsall and Peterborough United midfielder Keates was among a number of players to have been offered new deals by Wilkin. 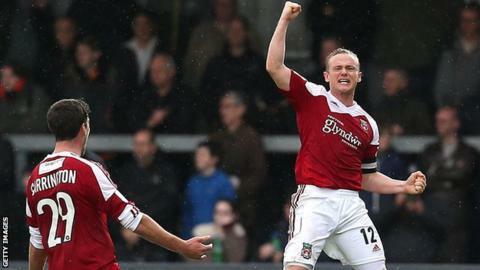 Keates agreed a new contract following talk with Wilkin and Wrexham's football operations chief Barry Horne. "I'm very happy that we were able to come to terms and shake hands on a new deal," Keates added. "It's for another season and I'm delighted to be staying on. "We have a new manager and there are bound to be some new faces in the squad, so combine that with some hard work and some good luck, then I don't think we will be far away next year."